The Titanic leaves Southampton, England, on April 10, 1912. It will be known as Discovery Times Square Exposition. The two companies announced Thursday that they merged their expertise so that more big scale “immersive” exhibitions could find a home in New York City. “So often, these major exhibitions bypass New York because there's no venue for them because of the size, the time requirements and expense,” said Running Subway Executive Producer James Sanna. 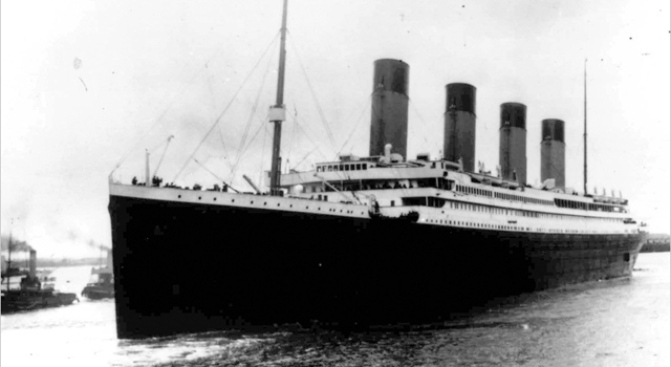 “Titanic: The Artifact Exhibition,” for example, has never been to New York even though it has been shown in many major cities around the world. Slated to open June 24, the Discovery Times Square Exposition's vast space _ the size of nearly two football fields over two floors -- will simultaneously feature two exhibitions that explore cultural and historical events. “Titanic” and “Lucy's Legacy: The Hidden Treasures of Ethiopia” will be the opening exhibitions. All the installations planned for the Discovery Times Square Exposition will be enhanced with additional artifacts not seen elsewhere. For example, of the 350 artifacts in the Titanic exhibition, over 40 have never been seen before, Sanna said. After the first two shows close, “Tutankhamun and the Golden Age of the Pharaohs” will be presented in early spring 2010. The show toured four U.S. cities _ not New York _ in 2005-2007. Featuring 130 objects, it is twice as large as the Tut show that first came to the United State on a seven-city tour in the 1970s, debuting at the Metropolitan Museum of Art. Like its TV programming, the shows will be “immersive” and “exploratory,” said Tom Cosgrove, Discovery Channel's chief operating officer. For example, in the Titanic exhibition, extensive stateroom re-creations are mixed with authentic artifacts retrieved from the ocean's bottom “that hopefully bring you closer to what it was really like” on the passenger ship before it hit an iceberg and sank in 1912. Some of the planned shows, such as “Lucy's Legacy,” have been controversial. The exhibition, which traces the evolution of the human race starting with a 3.2 million-year-old ancestral fossil discovered in 1974, most recently was shown at the Houston Museum of Natural Science. But some other major museums have refused offers to exhibit it after scientists expressed concern that the fragile fossil could be irreparably damaged. But Cosgrove said, “In no way are we going to risk any of the artifacts. Our goal is to do it with the utmost integrity, quality and authenticity.” The facility has “museum quality” climate control and lighting, added Sanna. The West 44th Street space that the center will occupy once housed the printing presses of The New York Times. Funding largely came from private investors. Sanna, who declined to disclose the cost, said he expected the center to draw more than 1 million visitors a year.